The historical setting for the Arthurian stories is the late 5th and 6th century of Britain. Prior to this was the famous departure of the Roman Empire from Briton, leaving behind a Romano-British culture which was pressed by Anglo-Saxon invasions. From this period there is not much primary written evidence; Gildas, a British monk who lived from around 500 to 570, is considered to be the major primary source. His major work, "On the Ruin and Conquest of Britain", is as much a conservative religious polemic as it is a recording of historical events. Notably however it doesn't not mention Arthur; rather it does describe Ambrosius Aurelianus, a Romano-Briton warleader who eventually reaches the position of "king among all the kings of the British nation". He also mentions the Battle of Mount Badon, where the Britons defeated the Saxons so severely that for many years further incursions were prevented. Later stories will associate Arthur with Mount Badon, but, in fact, it is not until the 9th century, in "The History of the Britons", the compilation by the Welsh cleric called Nennius, that the first mention of King Arthur is found, listing twelve battles that he fought in. Welsh poetry that reference Arthur, such as Y Gododdin, whilst attributed to originating from the 6th century, only exists as a primary source from the 13th century. Thus archaeologist Nowell Myres, a leading authority on the period, famously quipped "no figure on the borderline of history and mythology has wasted more of the historian's time". Well, except obviously for Jesus Christ, one should mention. There's no primary historical evidence of that somewhat more influential legendary figure either, although at least the canonical gospels are within living memory of the personage. For Arthur, we can be almost completely certain that he didn't exist, even if there were other individuals whose deeds contributed to the legend. In all probability he is a syncretic personality. If it is not from historical evidence, then where do we get the story of Arthur? Clearly, it is from prose and poetry. An very important contribution comes from Geoffrey of Monmouth whose "The History of the Kings of Britain", from around 1136, provides a historical fantasy which includes Merlin, various fantastic beasts, suggests that Ambrosius was the granduncle of Arthur, and has Arthur defeating the Roman Empire in Gaul (an elaboration, in my opinion, of the historic successful rebellion by Carausius). Shortly afterwards the Norman poet Wace, added The Round Table in his "Roman de Brut". Between 1170 and 1190 Chretien de Troyes, the French poet-composer, contributed several major poems and couplets relevant to the Arthurian legend, including courtly love and supernatural adventure. In doing so de Troyes is considered one of the best writers of medieval literature providing the structure that is considered to be the origins of the modern novel. Around the same time Robert de Boron added in the Quest for the Holy Grail to the story, and in 1485 - around a thousand years after they were set, Sir Thomas Malory wrote "Le Morte D'Arthur" which brought together the entire saga. With the waning of the middle ages and the rise of the modern society, interest in the literature of the "Matter of Britain" declined, and the genre of the noble knight would be mercilessly parodied by Miguel de Cervantes in his novel Don Quixote of 1605. The protagonist in that story reads so many chivalric novels that he actually goes quite mad and decides to set out to revive chivalry, undo wrongs, and bring justice in an increasingly modern world. A farmer, Sancho Panza, is recruited as his squire, who typically provides far more commonsense and than the mad knight living in a fantasy world. One could mention in passing the sad affliction of our current Prime Minister who also seems a little besotted with premodern titles, reintroducing knights and dames into the Australian honours lists and recently, and farcically, awarding an Australia knighthood to Phillip, the Queen's consort, the Duke of Edinburgh, Prince of Wales, of the House Schleswig-Holstein-Sonderburg-Glücksburg, most notorious for his racist and sexist remarks. But there were some examples, such as Henry Purcell and John Dryden's opera, King Arthur, first performed in 1691, and Richard Blackmore's epics using Arthur as a political allegory of the conflict between William III and James II. 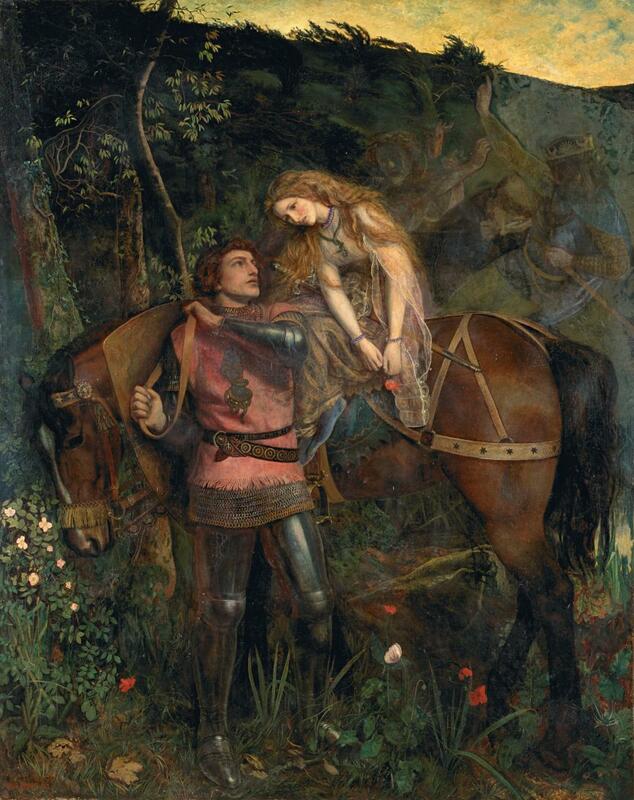 But it was really with the Gothic Romantics of the 19th century that interest in the Arthurian legend revived with William Wordsworth's "The Egyptian Maid" (1835) and Alfred Lord Tennyson's, "The Lady of Shalott" (1832) and "Idylls of the King" (1859) being notable. Across the Atlantic, Samuel Clemens, aka Mark Twain, put an early science fiction spin on the story with "A Connecticut Yankee in King Arthur's Court" (1889), where a time-travelling American is able to manipulate the superstitions of the medieval world with modern knowledge. Also of a syncretic nature is T.S. Eliot's famous poem "The Waste Land" (1922), primarily based on the legend of the Holy Grail and the Fisher King, but also incorporating literary elements from Buddhism and Hinduism. "Strange women lying in ponds, distributing swords, is no basis for a system of government. Supreme executive power derives from a mandate from the masses, not from some farcical aquatic ceremony!.. You can't expect to wield supreme power just 'cause some watery tart threw a sword at you!.. I mean, if I went 'round saying I was an emperor, just because some moistened bint had lobbed a scimitar at me, they'd put me away!" The opportunity is also taken here to mention Greg Stafford's "Pendragon" (1985) and "The Great Pendragon Campaign" (2006), along with Phyllis Karr's extraordinary compilation and commentary of source material into the "Arthurian Companion" (1997) as contemporary highlights in the tradition. Whilst many have noted how the medieval Arthurian stories are written with the seriously anachronistic technologies, social mores, and the expectations of author's own periods rather than the dark ages where it is nominally set, Stafford reinterprets these as part of the mythology utilising the anachronisms to become part of the narrative of a mythically enhanced environment which grows in technology and sophistication until the fall of the court. As one of the most extraordinary reconstructions ever attempted, Stafford also combines the divergent range of source material and provides a year-by-year fictional and mythic history from 485 AD to 565AD. This is particularly interesting given that mainstream commentary argues, quite fairly, that the use of anachronisms in Arthurian stories is a result of contemporary authors rewriting the legendary aspects to suit the circumstances of their own time. By adopting the anachronisms Stafford has introduced a new mythological element. In this context There is an enormous hint here in the reason why the Arthurian legends are constantly repeated and reconstructed; the core themes are placed in a context which are understandable for the an audience contemporary of the period, and express the biases, often social and political, of the authors. Scholars of the literature will often remark how convenient the Arthurian legends were to the Normans in their conflict against the Saxons, mention has already made of Blackmore's thinly veiled allegories, Clemens promotion of modern rationalism, and of contemporary radical reinterpretations of the story, albeit in the traditional setting. For aspiring novelists a golden opportunity exists for the re-telling of the tales with contemporary characters and setting. Whilst there is almost certainly no historical Arthur, there is an ongoing literary tradition attached to that name which has been carried down through the ages, originally based on a kernel of historical value. This literary tradition comes with thematic considerations and complex characters which although may be set in a fantastic pseudo-history, nevertheless can motivate and inspire. Do we not consider the chivalric traits, notions such as loyalty, forbearance, determination, generosity, mercy, and honour, to be worthy virtues regardless of time or place? Has not the organisational model of The Round Table and its metaphor of democracy been exemplified as an organisational structure where a high degree of equality among members is respected? Do we adhere to the principle that with great power comes great responsibility, and the potential for great corruption? What about the numerous characters who are found within the collection of legends? Do we respect Arthur's incredible stoicism and his commitment to the principles of just rule, even to the point that he is subject to manipulation? How do we react to Guinevere, who brought refinement and instituted courtly romance, but also fell into a destructive relationship with the champion, Lancelot. Do we condemn these star-crossed lovers or consider theirs a wistful and tragic tale? Is Mordred's bitter and treacherous conniving inexcusably evil, or at they at least worthy of pity? Is there not charm and metaphor in Pellinore's obsession in the lifelong and impossible hunt for the Questing Beast, which he never gives up "lest the poor creature die of loneliness"? From the dozens of major characters we find numerous interpretations, and are left with the realisation that many are quite complex personalities, and just like each of us, all are flawed. From these examples we can understand the inspirational power behind all epic stories, mythology, and even many religious stories. It is indeed the purpose behind artistic expressions of all sorts, for they too are as important to a balanced mind as the scientific quest for facts and truth, or the moral and political arguments for rightness and justice. The supernatural embellishments create a 'larger than life' setting with an implied degree of the sacred. The characters, despite these alien settings, speak of universal issues and struggles, and respond in a manner that is all too human. We derive great meaning from stories, because we see a little bit of ourselves or those we know in their reactions to the much more prosiac equivalent events confronted by the protagonists and antagonists of legend. If we learn this from such stories, can we not be motivated with heroic courage to confront with the greatest challenges of our time, with its own needs for justice and chivarly, and with the metaphorical monsters of our time? Can we satisfy those apocryphal words; 'Rex Quondam, Rexque Futurus', The Once and Future King? And can we heed the warnings and tragedies that the tales tell us? "A knight should be bold, fair, courteous and well-mannered, generous and loyal, not foolish or rash, and should speak fairly without discourtesy. A knight should be all this, and also proud and fierce to his enemies, and kind to his friends." 50	And evere honoured for his worthynesse. "Affability, courtesy, generosity, veracity, these were the qualisications most pretended to by the men of arms, in the days of pure and uncorrupted chivalry."